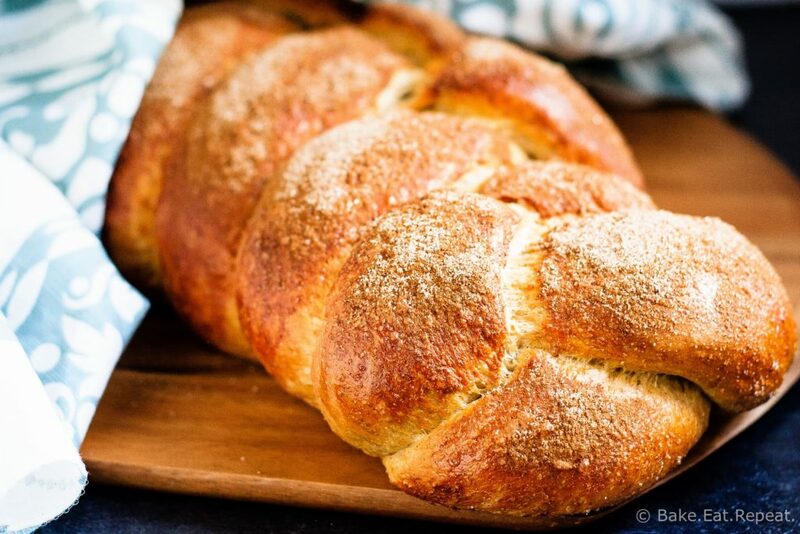 Have you ever had challah before? I hadn’t, until about a month ago when I first tried a recipe for it. I’ve made it 3 more times since, so….I like it. You should definitely try it too! This recipe is for a cinnamon challah bread. Basically I took a regular challah bread recipe and added cinnamon to the dough, then crusted the top with a cinnamon sugar coating. It was amazing. I’m pretty sure adding some raisins to the dough would be fantastic too, but unfortunately I kept forgetting to pick some up, so every time I went to make it I was disappointed to find that I was still out of raisins. Evidently they don’t restock themselves. I should probably be better with making (and actually looking at) grocery lists. Oh well. If you try it with raisins, please let me know how awesome it is! I’ve also made it as a fully white loaf (amazing), and as a whole wheat version (75% whole wheat) which was also really good. It was a bit denser, but that’s to be expected with a whole wheat bread. I had no complaints with the whole wheat version, and more importantly, neither did anyone else which says something! So you can definitely make it a bit healthier by using whole wheat flour. This was a very easy dough to make, mixing up quickly, and it was easy to work with. I used it to make French toast for my whole family, and my sister and sister-in-law informed me that I now need to make cinnamon challah every time we have French toast. It was that good. Of course, now that I’ve posted the recipe here, I’m pretty sure they’ll be making it for me, right? We’ll see. This homemade cinnamon challah bread is delicious! Come back Friday for the French toast recipe I used it in, along with a giveaway! Note: I’ve made this both with all purpose and whole wheat and both were amazing. The white bread IS fluffier, which is to be expected, but for a whole grain option to make it a bit healthier, the whole wheat version was still very good. I made it 75% whole wheat with 1 cup of all-purpose flour and 3 cups of whole wheat flour. If you have a kitchen scale, I would highly recommend weighing the flour for this recipe for a better result. Also, I think this would be fantastic with raisins added to the dough, but unfortunately always seem to be out when I make it, so I haven’t yet tried it! In a large bowl, or the bowl of a stand mixer, stir together the flour, sugar, salt, cinnamon and yeast. In another bowl, whisk together the oil, eggs, egg yolks and water. Pour the egg mixture into the flour mixture. With the dough hook attachment (or a wooden spoon) mix the ingredients together until they gather and form a ball. If the dough is really dry, add more water, a tablespoon at a time until it comes together into a ball and clears the sides of the bowl. If it is really sticky and is not clearing the sides of the bowl, add a bit more flour a tablespoon at a time. Knead the dough for 6-7 minutes by machine (10-12 by hand). The dough should be soft, but not excessively sticky. If it is really sticky, sprinkle in a little more flour. Transfer the dough to a lightly oiled bowl, turning it to coat, and cover the bowl with plastic wrap. Let the dough rise until doubled, about one hour. Punch down the dough to degas it, then cover, and allow it to rise until it has again doubled, another hour or so. Remove the dough from the bowl to a lightly oiled countertop, and divide it into three equal pieces. I use a kitchen scale to make the pieces as equal as possible. Form each piece into a rounded ball, cover, and let them rest for 10 minutes. Once they have rested, roll each piece out into a long strand, about 20 inches long. Braid the strands together, starting in the middle and then working your way out to each end (you get a nicer braid this way then starting at the end). Press the last couple inches of each strand together at the ends and tuck them underneath the finished braid to keep it together while it’s rising. Place the braided loaf on a parchment lined baking sheet and lightly spray it with cooking oil. Lightly cover the loaf with plastic wrap and then a clean dish towel and allow it to rise until it has grown to 1 1/2 times it’s size, about 60-75 minutes. Preheat the oven to 350 degrees F. Brush the beaten egg whites liberally over top of the risen loaf. In a small bowl, combine the sugar and cinnamon. Sprinkle this mixture liberally over top of the egg wash (you may not need all of the cinnamon sugar mix). Bake the loaf for 35-40 minutes, or until it is a deep golden brown colour, and a thermometer inserted in the center of the loaf reads 190 degrees F.
Transfer the loaf to a cooling rack and allow it to cool for at least one hour before slicing. b]Source:[/b] Slightly adapted from [The Bread Baker’s Apprentice . Made for Rosh Hashanna this year - 60 round individual sized challahs... was the big hit of the evening! Thanks! Been making challah for many many years, but never thought of cinnamon in it - I also added chopped apples to some, and raisins to some. So glad you enjoyed it Cherie! Love the idea of adding apples, and I've been wanting to try raisins so I'm definitely doing that next time I make it! Also love the idea of individual ones, I need to try that! Stacey, this challah bread looks perfect! I love it -- especially for French toast -- but have never made it. It's on my list, and I love this cinnamon version! So good, I'm glad I decided to try making it because I've never seen it anywhere to buy! Super easy bread to make, I will be making it often! Thanks Marcie! Just, WOW. I've never made Challah, but this is so beautiful! The cinnamon is so perfect for fall -- I can just imagine this as french toast! Such good French toast. So, so good. That's the only way I'm going to be able to make French toast now that I've tried it with this bread! Thanks so much Ashley! Anytime. Definitely anytime! But yes, the cinnamon does kind of scream fall! Thanks Ashley! I've made challah before, but never a cinnamon version! This looks so ultra-soft and fluffy I can hardly stand it, Stacey! Totally craving a slice right now with my coffee! Mmm, me too now that you say that. Need to make it again! :) Thanks Sarah! I LOVE challah -- and this sounds incredible with that crust! Your challah is gorgeous, Stacey!I Love the cinnamon in here! this look amazing Stacey! cinnamon just makes everything better! Cinnamon DOES make everything better, I agree! Thanks Manali! I've never had the real thing from a Jewish bakery, never even seen it anywhere, but considering how good this was I can imagine how amazing that would be! 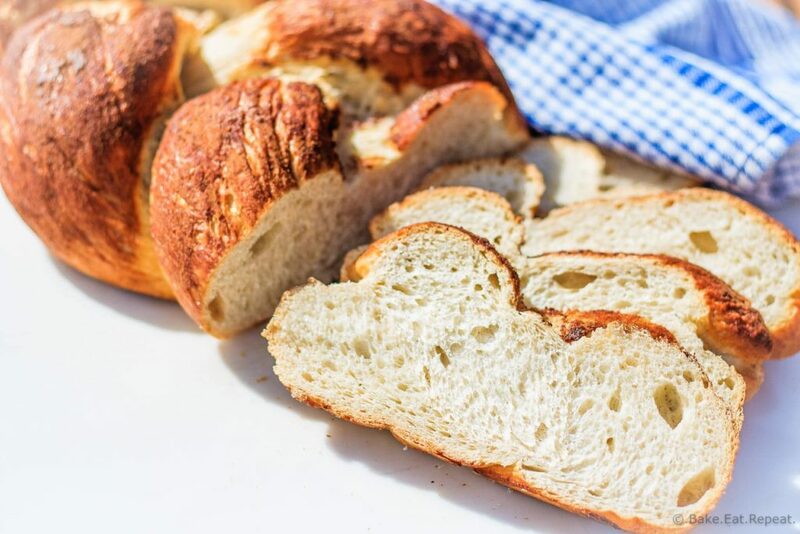 You should definitely try making it, it's a really easy bread to make! Thanks Jess! I love the delicious cinnamon sugar coating on top of this bread, imagine how good this would be in a French toast. Yum! What a delicious Challah! I have to make it ASAP, my children will love the addition of cinnamon. We loved the cinnamon, especially in the French toast we made with it! Thanks Ilona! I am seriously obsessed with this bread, Stacey. Challah is one of the few breads that I can actually make myself and the idea of making a cinnamon one is just blowing my mind! It was so good, I might need to always add a ton of cinnamon to it! Thanks Justine! I've been craving challah bread! This looks so good, I think I'll need to make it ASAP! Have I heard of challah? I bake it every week, Stacey! It's a huge part of my religion, so I bake it every Friday and then we have leftovers for French toast on Sunday, if there are any. Yours looks really good! You've got the braiding down pat! Haha, I didn't ask that, I asked if you've ever had it - and of course you have! I never had before though, I know it's a huge part of your religion, I've read about it, but I've never even seen it anywhere here so I'd never tried it before. I kind of feel like I've been missing out now that I've tried it! Good to know it looks the way it's supposed to! Thanks Mir! We love Challah bread in this house, but I stink at making it! I will definitely give this recipe a try. Looks delish! I found this dough super easy to work with, and easy to make. Hope you try it, it was amazing! Thanks Tiffany! I am a huge bread lover!! But I have always been to afraid to make my own, you have inspired me to give it a try! Oh you definitely need to try Mariah! So much better than store-bought and really not hard. It's pretty tough to mess it up I think! :) If I can do it anyone can! Haha, yeah, and you have to make it a day or two ahead of time for great French toast, so it's pretty tough NOT to eat it all before breakfast! Thanks Alyssa! I love challah and would love to try it! The whole wheat version sounds great! Pinning! I've never had Challah before, but it is SO pretty! And I'm definitely sold on anything with cinnamon sugar. Can't wait to see your french toast recipe! Isn't it a pretty bread? Something about the braiding I think! And yes to anything with cinnamon sugar, it's always fantastic! Thanks Denise! I have only had Challah once... And man was it tasty! I can only imagine Cinnamon making it more so! Cinnamon just makes everything better, right?! Thanks! I love challah! I've never made it, but it's my go-to bread for French toast! It's looks amazing, Stacey! I've never even seen it anywhere to buy, but maybe you have to go to actual bakeries? It definitely made the best French toast I've ever had, so I don't know that I'll be going back to French bread! Thanks Michelle! Now I want to go make some bread! This is beautiful and looks so fluffy and delicious! This looks perfect, so yummy! 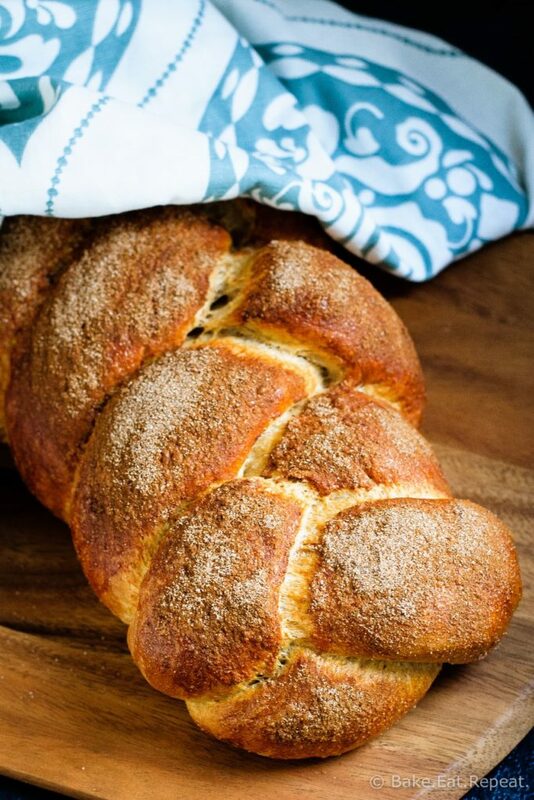 I love making homemade bread and your cinnamon challah recipe seriously looks perfect! There are no flaws! Hahaha, well....the flaws may have been on the end of the loaf that I didn't put in the pictures! :) But thanks, I'll pretend that my bread is always perfect! It did taste amazing, I'll be making it many more times I'm sure! Thanks Kacey! I've only had challah once, and I remember loving it! This cinnamon version looks fantastic, Stacey! I bet your house smelled SO good when this was baking! Anything cinnamon makes the house smell so amazing, I think that's why I love cinnamon so much! Thanks Gayle!